See the sights of Midtown Manhattan in a glittering display of lights aboard a double-decker bus at night. This 1 hour and 45 minute loop covers Times Square, the Empire State Building, the Brooklyn Bridge and much more, with each landmark illuminated after dark in the city that never sleeps. 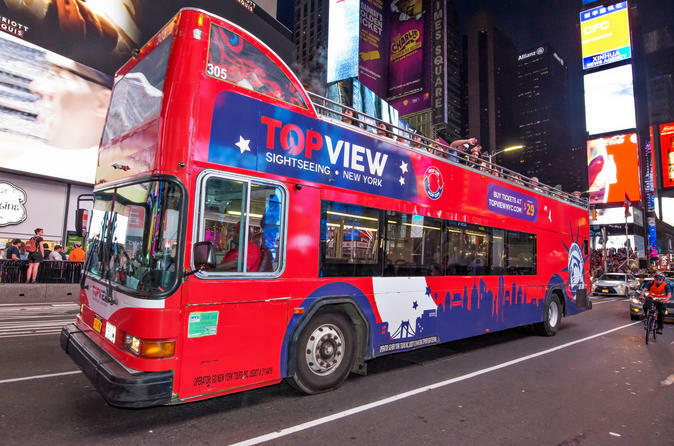 Start your double-decker bus tour from Midtown Manhattan and see New York City illuminated at night. Throughout the 1 hour and 45 minute route, listen via audio headsets as your guide relates interesting and sometimes amusing stories about this historic district. You'll motor past the postcard-perfect landmarks of Times Square, the Empire State Building, the United Nations, Rockefeller Center, Chinatown, Little Italy, NoHo, SoHo, the Brooklyn Bridge and the Manhattan Bridge, with priceless views of Manhattan at night.